Wood Boiler: Open or Closed System?Open or Closed System? Open or Closed System, what does that mean and what are the benefits? The easiest way to explain this is to compare a boiler system to a vehicle cooling system. On a vehicle, the cooling system is closed. There is a pressurized cap that will vent if the tempertures get to hot and the system begins to boil over. Rather than exploding, the cap releases the presure and the fluid escapes. There is also a thermosat in the system which opens and closes according the coolent temps. When the vehicle is cold in the morning, the thermosat is closed and recirculates the water through the engine block, allowing the engine to reach operating temps faster. Once the engine is warm, the thermosat opens and coolent flows through the system, regulating the tempertures to the engine so it runs at optimum temps. 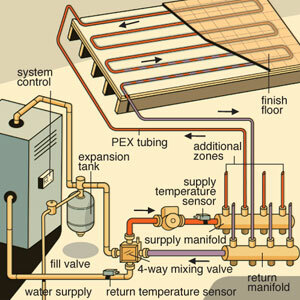 Now picture your wood boiler as the engine and the cooling system as your radiant heating system. They are very similar in design. The main benefit of a closed system is that the water will not boil as quickly and it boils at a hotter temperture than 220 degrees which is where water boils at sea level. That changes with elevation. So in a nut shell, you can run a boiler hotter under pressure than you can an open system. So why would you want an open system? The main reason is saftey, an open system is not presurized and therefore can not explode if improperly installed. In many places it is a crime to mess with a pressurized boiler system if your not properly licensed to do so. Many people have died in boiler explosions over the years, so the authorities are pretty strict for obvious saftey reasons. Properly installed, pressurized boilers are as safe as any domestic hot water tank. Open system boiler systems are non pressurized and called “Open” because they vent naturally to the atsmosphere. If the boiler is overfired and boils, steam comes out a pipe and is vented. It cannot explode because it can not build pressure. There are many boilers in service that employ this method. The main drawback of these types system is they must be mointered constantly and kept full of water. The water is constantly evaporated off the system and must be replaced or the boiler will eventualy fail from overheating. It will normally make a terrible racket causing you to think there is an 800 lb. gorilla inside that is not happy. If that happens you have a few minutes to save your boiler. There are automated fill systems that will keep your boiler full of water at all times. If you choose an open boiler system, make sure you invest in a good one. If the automated fill system fails it will normaly either flood the boiler room with tap water, or not add water as needed. Always check this system and make sure it is functioning properly. There is such a thing as an combo open/closed boiler system. This is common when you find the boiler is an open system and the radiant system is closed. Most radiant systems and heat handlers are closed. 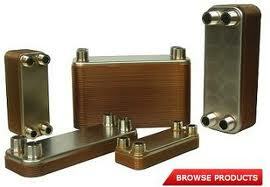 The way this is accomplished is through a heat exchanger that can be a finplate, or a sidearm exchanger. The open boiler system is its own loop and it circulates that way. BTUs are transferred through a heat exchanger into the closed loop system.